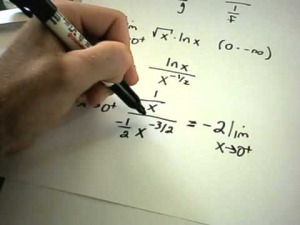 In this course, Calculus Instructor Patrick gives 17 video lessons on Limits. Topics covered include: L'Hopital's Rule, Continuity, Limits at Infinity and many more. Calculus Instructor Patrick in Lesson 13: L'Hopital's Rule: Indeterminate Products. Abhi tubby wrote 4 years ago. olumide wrote 6 years ago. shivangi wrote 7 years ago. big 3 wrote 8 years ago. Dakota wrote 8 years ago. D. Erickson wrote 8 years ago.